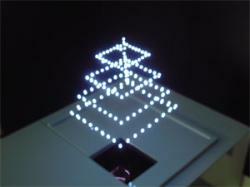 New Scientist has a cool article about a new laser technology which can be used to draw shapes in the air. I’d thought about something like this in the past, but figured you would need a set of lasers which could cross at pixel points to create a 3D grid you could write on. Actually, at the time I was thinking more about using a set of ultrasonic waves to interfere with each other and create localized sound points, but the concept is fundamentally the same. What these guys have done is more interesting, basically focusing a single laser using a lens. Assumedly at the focal point the laser’s energy will exceed a certain threshold and create a glowing plasma pixel. So cool! I wonder how much the threshold point would vary in the air due to weather conditions?